L 3 3/4″ (10 cm). Low chipping and buzzing notes. Also excited “zeee-chuppity-chup” is often heard. 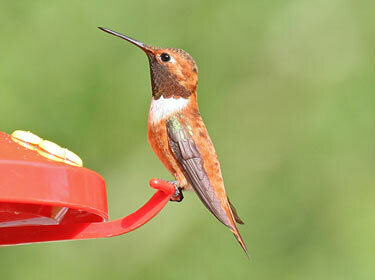 Description: Bright iridescent orange-red gorget of male contrasts with non-iridescent rufous upperparts and sides; white breast; mainly rufous tail. 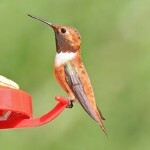 Female is green above, with rufous on the sides and at the base of the tail feathers. Juveniles resemble adult females. 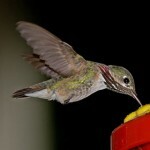 Habitat: Migrants can be found in plains, foothills, and urban gardens. Where in Nebraska: Rare fall migrant in extreme western parts of the state. Most of records are from Scotts Bluff County. Field Notes: No spring records of this bird in Nebraska. 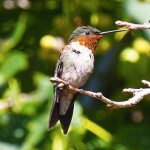 Fun Facts: Rufous Hummingbirds have the longest migration of hummingbirds; 3,000 miles from Alaska and Canada to Mexico.